Where to Buy Yellow Jacket Bait Station /w Onslaught, Alpine Yellow Jacket Bait Station Kit with Onslaught - $72.95 for Sale with Fast Free Shipping! 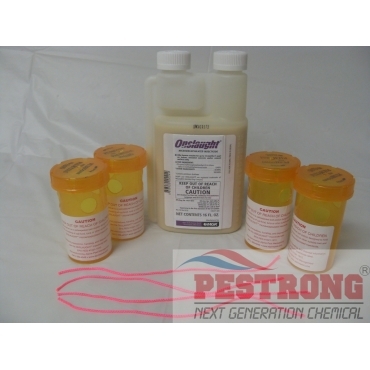 Alpine Yellow Jacket Bait Station Kit with Onslaught provides easy and effective way to control yellow jacket year after year with onslaught insecticide. Alpine Yellow jacket Bait Station Kit with Onslaught is designed and labeled for use with onslaught microencapsulated insecticide. When used together, they are the perfect combination for controlling yellow jackets around residences, restaurants, resorts, campgrounds, zoos and other areas where humans or animals are harassed by yellow jackets. Useful Yellow Jacket Information: Only the fertilized female yellow jacket over winters. All males die during the winter...This may be the reason they are so aggressive in the early fall because they know this is their last "Hoorah". When fertilized females emerge from hibernation in early spring, she needs protein to nurse her young offspring. To start with she is a single mom doing it all until she can raise some workers. Traps placed and maintained in the early spring will help to severely reduce the yellow jacket population in the fall. For every female you capture in the early spring, that will eliminate a yellow jacket nest of 500 to 5,000. Good product for yellow jacket bee control.